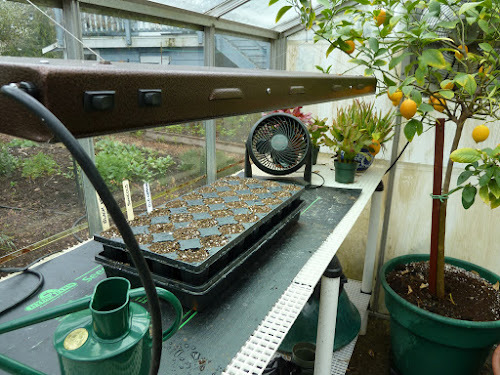 My Home and Garden: Heat mat and grow lights set up for tomato seeding. Heat mat and grow lights set up for tomato seeding. I love this time of year. Once the lights and mat are set up, I feel like it's spring!! I have really cut down on the number of tomatoes I am starting this year. I always grow WAYYYYY more than I need...or can even give away. So I have seeded four Sungold, four Black Krim and four Old German. The Black Krim seeds were taken from a massive plant bearing massive delicious tomatoes in 2014. I tried Old German last year, but they were the wrong tomatoes. Westcoast Seeds sent me a new package, so I thought I would try again. 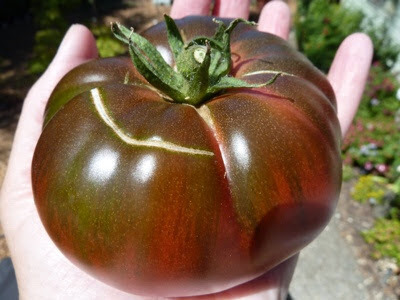 Sungolds are the most delicious cherry tomato ever and Black Krim is truly the most delicious tomato I have ever tasted. I gave my sister one of the few I got last year and she and her husband both said it was the best tomato they had ever eaten too. So there you go! !